Beloved husband and best friend of Maria F. Perez, passed away peacefully surrounded by the ones he laughed with, lived for and loved on April 2, 2019. On October 23, 1968, he married Mary Fuentes. Together they had a son, Domingo Perez and daughters, Veronica Perez and Juanita “Janie” Perez-Nunez. Morro’s special interests and hobbies included raising a family and caring for God’s creations through planting trees, gardening and caring for his beloved ranch animals. Morro could accomplish anything he set his mind to. At an early age, he was breaking horses, a skill he passed on to his children. Morro was a self-made businessman, who started from scratch with less to zero resources and was able to establish his air-conditioning, heating and cooling business and served the community of San Angelo and the surrounding areas. The family would like to express their sincere gratitude to Hospice of San Angelo for their dedication and efforts to provide quality care to Morro was a heartwarming blessing to our family. We thank God for the gift of his life and the blessing of the time we spent with him. Loved ones that cleared the path for “Morro” are his parents, Pantaleon Perez, Sr. and Maria R. Perez, his sister, Ramona P. Ortegon and his brother, Julian Perez. 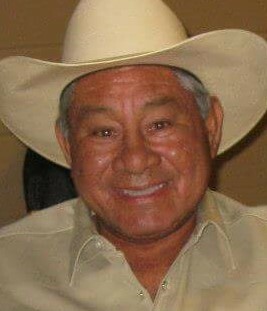 Loved ones that will miss “Morro” until they meet again are his wife, Mary F. Perez, his son, Domingo Perez, his daughters, Veronica Perez and Juanita “Janie Perez-Nunez, his beloved grandchildren, Suzanne Rose, Tasha Rose, Devin Soto, Domingo Gutierrez, Juliana Nunez, Julian Nunez, Brittany Perez, and Brady Perez. His special great grandchildren, Alexis Rose, Alex Salinas, Kaylen Creek and Zayla Rose, his brother, Abel Perez and sisters, Sarah Ramirez and Rosalinda Del Rio. Escorting "Morro" to his final resting place are Leroy Vasquez, Brady Perez, Rocky Perez, Julian Perez, Abel Perez and Jim Moya. A Wake Service was held on Wednesday at the Gutierrez Funeral Chapels/North. Funeral Mass will be at 10:00 am on Thursday at St. Mary's Catholic Church with interment following at Calvary Catholic Cemetery under the direction of Gutierrez Funeral Chapels/North.